Benign neglect here. 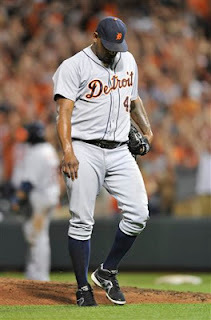 DD has allowed Valverde, and Dotel to slip over the hill. Rondon may help , but getting it done in Toeldo, doesn't a closer make. There is little doubt that Dombrowski will unload a group of prospects to obtain a closer for the post season. His judgement , so far, on which prospects to part with has been pretty good. This is a team that is totally out of synch, particularly the bullpen. Given the troops that DD has given him, it is Leyland's job to fix it.